Definition at line 16 of file CREMapInformationManager.h. Definition at line 55 of file CREMapInformationManager.cpp. References myMessageManager, myQuestManager, and myScriptManager. Definition at line 65 of file CREMapInformationManager.cpp. Definition at line 627 of file CREMapInformationManager.cpp. Referenced by checkInventory(), loadCache(), and process(). Definition at line 345 of file CREMapInformationManager.cpp. Definition at line 70 of file CREMapInformationManager.cpp. Definition at line 285 of file CREMapInformationManager.cpp. 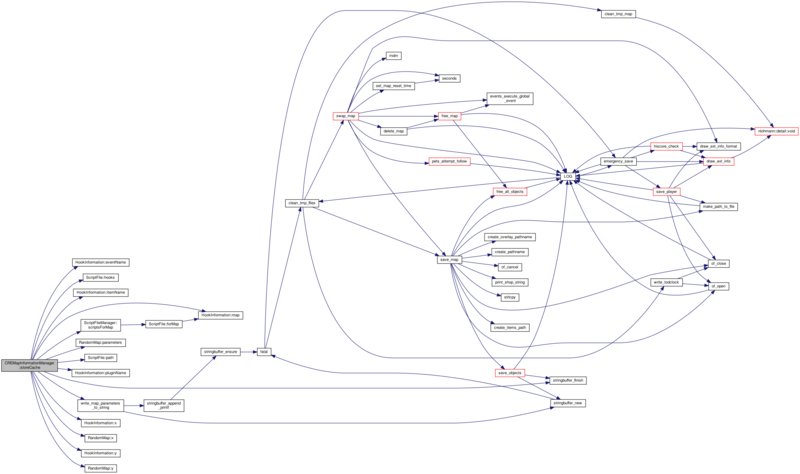 References archt::clone, create_pathname(), finished(), first_archetype, first_map_ext_path, first_map_path, loadCache(), MAX_BUF, myArchetypeUse, myCancelled, myCurrentMap, myExperience, myInformation, myToProcess, archt::name, archt::next, PLAYER, process(), snprintf, storeCache(), and obj::type. Definition at line 339 of file CREMapInformationManager.cpp. Definition at line 634 of file CREMapInformationManager.cpp. References ScriptFile::addHook(), CREMapInformation::addMessage(), CREMapInformation::addQuest(), EVENT_CONNECTOR, EVENT_SAY, eventNames, QuestManager::findByCode(), MessageManager::findMessage(), ScriptFileManager::getFile(), Quest::maps(), MessageFile::maps(), myMessageManager, myQuestManager, myScriptManager, obj::name, NR_EVENTS, CREMapInformation::path, obj::slaying, obj::subtype, obj::title, obj::type, obj::x, and obj::y. Definition at line 83 of file CREMapInformationManager.cpp. References CREMapInformation::addArchetype(), addArchetypeUse(), checkEvent(), find_archetype(), FOR_INV_FINISH, FOR_INV_PREPARE, and archt::name. Definition at line 700 of file CREMapInformationManager.cpp. References CRESettings::mapCacheDirectory(), myWorker, and settings. Definition at line 351 of file CREMapInformationManager.cpp. References myArchetypeUse, myLock, and archt::name. Definition at line 687 of file CREMapInformationManager.cpp. Definition at line 617 of file CREMapInformationManager.cpp. Definition at line 357 of file CREMapInformationManager.cpp. References CREMapInformation::addAccessedFrom(), CREMapInformation::addArchetype(), addArchetypeUse(), CREMapInformation::addExitTo(), ScriptFile::addHook(), CREMapInformation::addMessage(), CREMapInformation::addQuest(), CREMapInformation::addRandomMap(), QuestManager::findByCode(), MessageManager::findMessage(), ScriptFileManager::getFile(), Quest::maps(), MessageFile::maps(), myInformation, myMessageManager, myQuestManager, myScriptManager, CREMapInformation::setExperience(), CREMapInformation::setLevel(), CREMapInformation::setMapTime(), CREMapInformation::setName(), CREMapInformation::setPath(), CREMapInformation::setRegion(), CREMapInformation::setShopGreed(), CREMapInformation::setShopMax(), CREMapInformation::setShopMin(), CREMapInformation::setShopRace(), settings, and CREMapInformation::shopItems(). Definition at line 95 of file CREMapInformationManager.cpp. References add_map(), add_region_link(), CREMapInformation::addAccessedFrom(), CREMapInformation::addArchetype(), addArchetypeUse(), CREMapInformation::addExitTo(), ScriptFile::addHook(), CREMapInformation::addRandomMap(), browsingMap(), checkInventory(), create_pathname(), delete_map(), mapdef::difficulty, do_regions_link, EVENT_CONNECTOR, eventNames, EXIT, EXIT_PATH, CREMapInformation::exitsTo(), find_archetype(), FLAG_MONSTER, FOR_MAP_FINISH, FOR_MAP_PREPARE, get_map_info(), ScriptFileManager::getFile(), getOrCreateMapInformation(), mapdef::in_memory, shopitem::index, MAP_HEIGHT, MAP_IN_MEMORY, MAP_WIDTH, CREMapInformation::mapTime(), MAX_BUF, myCancelled, myExperience, myLock, myScriptManager, myToProcess, CREMapInformation::name, regiondef::name, shopitem::name, mapdef::name, archt::name, NR_EVENTS, mapdef::path, path_combine_and_normalize(), PLAYER_CHANGER, QUERY_FLAG, ready_map_name(), mapdef::region, ScriptFileManager::removeMap(), mapdef::reset_time, CREMapInformation::setExperience(), CREMapInformation::setLevel(), CREMapInformation::setMapTime(), CREMapInformation::setName(), CREMapInformation::setRegion(), CREMapInformation::setShopGreed(), CREMapInformation::setShopMax(), CREMapInformation::setShopMin(), CREMapInformation::setShopRace(), mapdef::shopgreed, CREMapInformation::shopItems(), mapdef::shopitems, mapdef::shopmax, mapdef::shopmin, mapdef::shoprace, start(), shopitem::strength, TELEPORTER, and mapdef::tile_path. Definition at line 707 of file CREMapInformationManager.cpp. Definition at line 75 of file CREMapInformationManager.cpp. Referenced by CREMainWindow::CREMainWindow(), and process(). Definition at line 511 of file CREMapInformationManager.cpp. References CREMapInformation::accessedFrom(), CREMapInformation::archetypes(), HookInformation::eventName(), CREMapInformation::exitsTo(), CREMapInformation::experience, ScriptFile::hooks(), HookInformation::itemName(), CREMapInformation::level, HookInformation::map(), CRESettings::mapCacheDirectory(), CREMapInformation::mapTime(), CREMapInformation::messages(), myInformation, myScriptManager, CREMapInformation::name, CRERandomMap::parameters(), ScriptFile::path(), CREMapInformation::path, HookInformation::pluginName(), CREMapInformation::quests(), CREMapInformation::randomMaps(), CREMapInformation::region(), ScriptFileManager::scriptsForMap(), settings, CREMapInformation::shopGreed(), CREMapInformation::shopItems(), CREMapInformation::shopMax(), CREMapInformation::shopMin(), CREMapInformation::shopRace(), stringbuffer_finish(), write_map_parameters_to_string(), HookInformation::x(), CRERandomMap::x(), HookInformation::y(), and CRERandomMap::y(). Definition at line 43 of file CREMapInformationManager.h. Referenced by addArchetypeUse(), browseMaps(), and getArchetypeUse(). Definition at line 47 of file CREMapInformationManager.h. Referenced by browseMaps(), cancel(), and process(). Definition at line 45 of file CREMapInformationManager.h. Definition at line 49 of file CREMapInformationManager.h. Referenced by browseMaps(), and process(). Definition at line 42 of file CREMapInformationManager.h. Referenced by allMaps(), browseMaps(), getMapsForRegion(), getOrCreateMapInformation(), loadCache(), randomMaps(), storeCache(), and ~CREMapInformationManager(). Definition at line 48 of file CREMapInformationManager.h. Referenced by addArchetypeUse(), allMaps(), getArchetypeUse(), and process(). Definition at line 39 of file CREMapInformationManager.h. 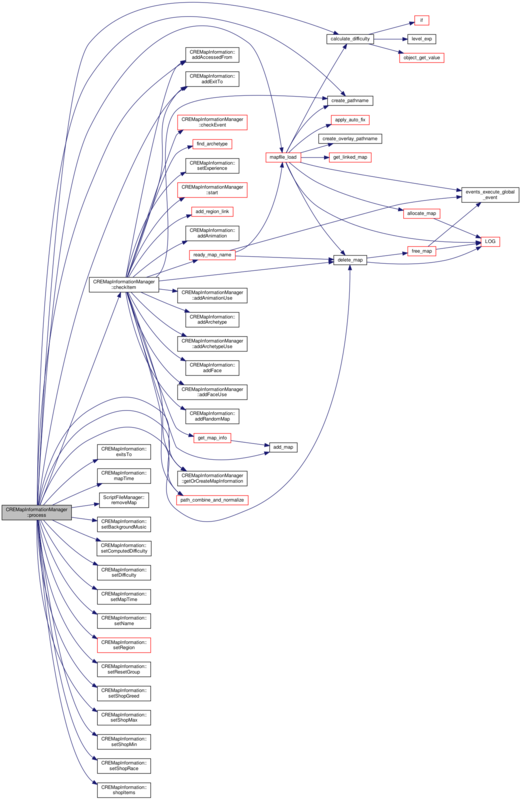 Referenced by checkEvent(), CREMapInformationManager(), and loadCache(). Definition at line 40 of file CREMapInformationManager.h. Definition at line 41 of file CREMapInformationManager.h. 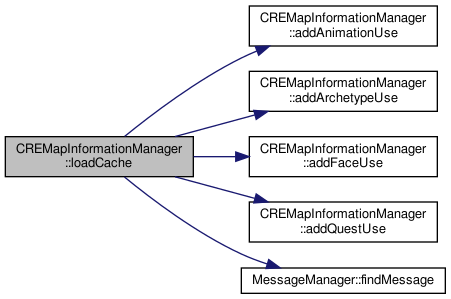 Referenced by checkEvent(), CREMapInformationManager(), loadCache(), process(), and storeCache(). Definition at line 44 of file CREMapInformationManager.h. Definition at line 46 of file CREMapInformationManager.h. Referenced by browseFinished(), cancel(), clearCache(), and start().